The majority of food businesses in Bangladesh are rural and small-scale. Without spare money to invest in technology or new production methods, businesses tend to use inefficient manufacturing processes. Furthermore, the poorest businesses are less likely to support labour rights and decent conditions for workers, or to meet standards for food safety or environmental protection. A new project, SHAMERTO, of which Traidcraft Exchange is a partner, aims to support small food processing businesses and train workers to take on high-quality employment. This will focus on different supply chains, from groundnuts to mung beans to mustard, but the most interesting recent work has involved wheat, and specifically the supply chains of small bakeries. To that end, the project is working with small businesses to build their competitiveness and their capacity to take on new employees. 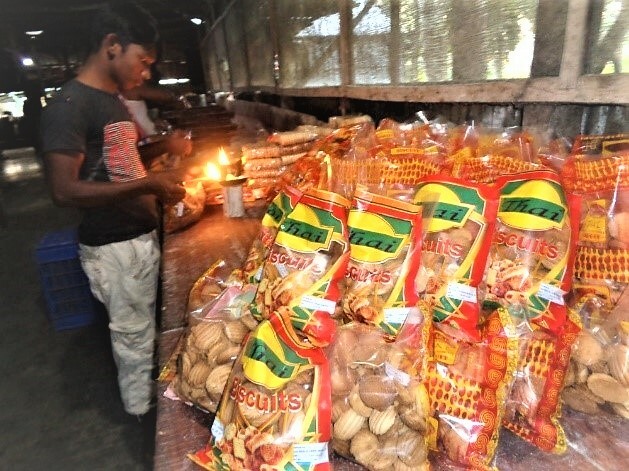 In Chilmari, in the north of Bangladesh, most bakeries do not have their own sales outlets or channels of distribution. Therefore, they have to rely on commissioning agents to market their bread, biscuits and cakes. These agents sell produce onto wholesalers and retailers, charging a commission rate that varies between 8% and 14%. The smaller bakeries, with less market power, are less likely to be able to negotiate a favourable rate from agents, and suffer unexpected losses as a result. It's not just that the percentage cut taken by agents can be too high – it’s the unpredictability of the whole situation that causes the most stress for bakers. Without knowing how much the agent will end up charging, it’s almost impossible to do any business planning – meaning that bakers are less likely to invest in growing their businesses or giving their workers a pay rise. To address this issue and to balance the interests of both the bakeries and commissioning agents, the SHAMERTO project organized a day long ‘match-making’ workshop with small bakery businesses and the commissioning agents, along with other interested parties such as the local Chambers of Commerce. Our experience is that decent solutions to problems in supply chains require dialogue, however uncomfortable that may be for the parties involved. At the workshop bakers and agents shared their concerns, discussing why the commission charged varied on a case-by-case basis and agreeing that greater clarity over the size of the commission would be desirable. Both parties agreed on a fixed commission rate to be established across the region, arriving upon 12% as a good rate that balanced the interests of both parties. After attending the match-making workshops, the bakeries also improved their relations with raw material suppliers to ensure regular supply of quality raw materials – more certainty around income means that bakers can be more certain about their expenditure, and so the benefits of improved dealings in one part of the supply chain are felt elsewhere. So, the last few months of work has not only increased the sales and profit margin of the bakers, but has also helped them to build the trust and cooperation in their business community. They are optimistic about the future of their business now and look forward to the support from SHAMERTO project in the form of similar workshops and match-making efforts to balance the interests of all parts of the supply chain and to help identify a win-win situation in the bakery sector of Chilmari. Sonya Firoz is Traidcraft Exchange's Senior Programme Manager in Bangladesh. To find out more about our work transforming trade, click here.